It has been estimated that approximately 30% of patients diagnosed with primary lung cancers present with central airways disease at the time of diagnosis and, as the disease progresses, obstructive symptoms contribute significantly to the morbidity of the disease [2, 3]. Narrowing of the trachea and main carina may cause profound dyspnoea and lead to an unpleasant death through slow asphyxia, while obstruction of the bronchial tree may cause disabling cough and breathlessness due to retained secretions and recurrent infection. Most of these cases are inoperable and, although palliative radiation therapy is an option, which can reduce the tumour size, its effect is slow and limited by the total radiation dose while regression of atelectasis is only achieved in 21% of cases without local treatment . A variety of bronchoscopic treatments have now been developed to relieve localised airway obstruction by resecting or shrinking the tumour within the lumen of the airway or by overcoming airway compression by extraluminal disease. These treatments have the advantage of restoring airway patency more rapidly than conventional external radiotherapy and are likely to be successful if there is a patent airway supplying viable lung tissue beyond the level of obstruction. Appropriate patient selection is essential and requires careful clinical judgement. The majority of treatments are given with palliative intent and it is important to determine that the patient’s quality of life is limited by the obstructing lesion. As an example, there is little point in treating a patient with severe chronic obstructive pulmonary disease (COPD) who is limited by generalised airways disease, whereas a similar lesion in a patient with otherwise healthy lungs will exhibit significant symptomatic and functional benefits. In a small proportion of patients, treatment is given with curative intent. This may be as a bridging procedure, enabling subsequent oncological treatment to be given electively and in greater safety, or as a definitive treatment in patients unfit for more conventional therapy. The most basic treatment modalities are used to resect tumour growing within the lumen of the airway. 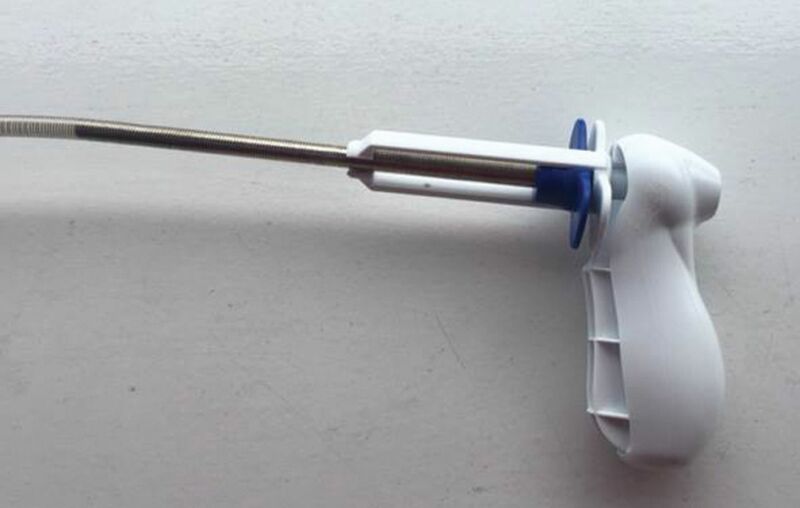 A tumour may be removed endoscopically by heating and vaporisation, freezing or simply resecting with biopsy forceps. A variety of techniques has been developed and has been shown to be effective. Randomised controlled studies have not been undertaken to establish which is most effective and the choice of treatment usually depends on the clinician’s preference and particular facilities available in any given centre. Although comparative studies have not been undertaken, endoscopic laser resection has become the most widely used technique for tumour debulking worldwide. As a consequence, there is a more extensive literature documenting the symptomatic and functional benefits of laser treatment than for other modalities though it is likely that equivalent benefit can be obtained using these other techniques. “Laser” is an acronym for ‘light amplification by stimulated emission of radiation’. Endobronchial laser treatment entails the application of laser energy delivered via rigid and/or flexible bronchoscopes and is usually given under general anaesthesia. There are several lasers currently used within the airways: neodymium:yttrium-aluminum-garnet (Nd-YAG), potassium-titanyl-phosphate (KTP), argon ion, excimer, alexandrite, semiconductor and carbon dioxide (CO2) . Nd-YAG is the most frequently used laser for bronchoscopic work and emits energy at a wavelength of 1,064 nm [5–7]. It is used at 10-40 W, but its power output can increase up to 100 W. The depth of the tissue affected by the laser varies from several millimetres to several centimetres depending on the power output. The laser energy can be conducted via a quartz monofilament optical fibre and thus can be easily used with either rigid or flexible bronchoscopes or a combination of both with anaesthetic cover. Major tissue effects include vaporisation and coagulation, which seal small blood vessels as the tumour tissue shrinks. As a consequence, the operator is able to perform mechanical debulking with biopsy forceps with minimal bleeding. Table 1 highlights the indications, contraindications and complications of endobronchial laser. Training in laser safety is essential for all members of the endoscopy staff. They should be familiar with the equipment and take responsibility for ensuring that the correct laser power settings and pulse durations are employed. The eye is not protected from stray laser radiation by the blink reflex and all personnel present in the endoscopy suite should therefore wear protective goggles. When offering endobronchial laser treatment, care is taken to reduce the risk of an airway fire. The operator should ensure there are no flammable objects within the airway (e.g. non-laser-proof endotracheal tubes and stents are avoided). 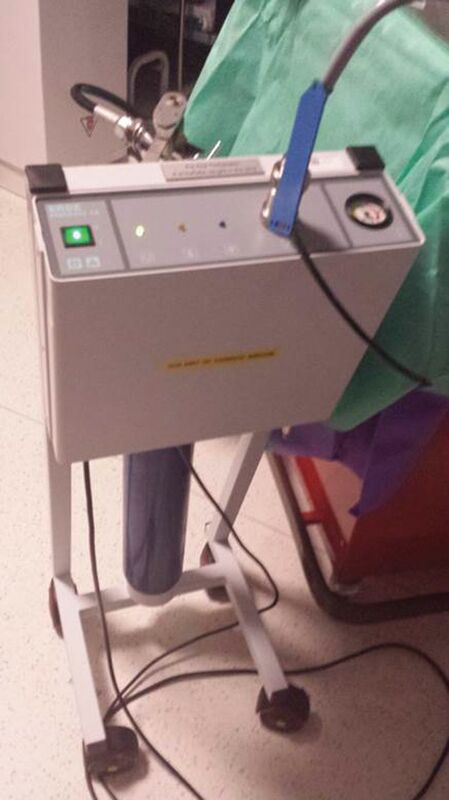 The anaesthetist should also regulate the inspiratory oxygen fraction during treatment and, although practices vary, our own experience has shown that an inspiratory oxygen fraction of <65% offers a safe environment when using diode and Nd-YAG lasers in combination with flexible and rigid bronchoscopes. With some techniques, the optical fibre, which transmits the laser beam, is directed at the tumour with a flexible bronchoscope and the operator should ensure that the laser is only fired when the tip of the optical fibre protrudes beyond the tip of the bronchoscope in order to avoid thermal damage (figure 1). Relationship between the rigid and flexible bronchoscopes and the laser fibre. The tip of the optical fibre must always protrude well beyond the bronchoscope to avoid thermal damage. Reproduced from  with permission from the publisher. Treatment can be administered with rigid and/or flexible bronchoscopy. When using flexible bronchoscopy alone, treatment can be administered under sedation without anaesthetic support and there has been considerable debate as to which system offers greatest safety and efficacy. Published data from UCL Hospitals in London indicate that endobronchial laser treatment administered with a combination of rigid and flexible bronchoscopy under general anaesthesia offered greater efficiency and safety and, although this was not a randomised controlled study, this remains the authors’ preferred technique . Numerous studies have reported improvements in quality of life and symptom relief associated with a respectable post-treatment life expectancy in a majority (84–92%) of patients [7, 9–11]. Overall, the anatomical location of the obstruction is related to the level of improvement: patients with central airway obstruction tend to exhibit greater improvements than those with more peripheral airway obstruction . In a study of patients with tracheal tumours presenting in severe respiratory distress who were treated urgently with the laser, there were dramatic improvements in symptoms and lung function, with improvements in peak expiratory flow (PEF) ranging between 26 and 512%, 3 days after treatment . It is well recognised that patients with central airway tumours are frequently misdiagnosed as having asthma and are only diagnosed at a late stage when at risk of asphyxia [13, 14]. The particular value of tumour debulking with the laser in this situation is that it provides immediate relief, which provides time in which to diagnose and stage the disease, so that definitive oncological treatment can be given electively and in greater safety [6, 15]. This is well demonstrated by the patient illustrated in figure 2, who was initially diagnosed with COPD but was subsequently found to have an adenoid cystic carcinoma obstructing the lower trachea when close to asphyxia. Following urgent laser treatment, there was a marked symptomatic and functional improvement, which facilitated an elective tracheal resection. a) Flow–volume loops obtained before and after laser treatment for a patient with an adenoid cystic carcinoma of the trachea (b). The patient was originally misdiagnosed as having severe COPD. Reproduced from  with permission from the publisher. Treatment for more peripheral endobronchial obstruction produces less dramatic improvement and its physiological value has been questioned. It is known that tumours obstructing major bronchi not only impair ventilation but may also compromise perfusion by compressing the pulmonary vessels. Although resection of the intraluminal component of the tumour may lead to improved ventilation, it may have no effect on perfusion with the result that it simply leads to an increase in “dead space” within the lung. This question was addressed in a study of 28 consecutively treated patients with unilateral endobronchial obstruction in which radionuclide lung scans were performed immediately before and 3 days after laser resection . The study demonstrated improvements in ventilation scores, which were matched by improved perfusion scores in the treated lung and by improved symptom scores and 6-min walking distances . Although further physiological studies were not undertaken, it was suggested that the improvement in perfusion occurred as a result of a correction in alveolar hypoxia after successful airway recanalisation. There is general agreement that patients presenting in severe respiratory distress due to major airway obstruction are not easily recruited into randomised clinical trials in which treatment is withheld in a control group. It has therefore not been possible to demonstrate survival benefits of treatment. Brutinel et al. conducted a retrospective study comparing outcomes in 25 patients who would have been candidates for endobronchial laser treatment, but did not receive it due to unavailability of the service at that time, with outcomes observed in 71 patients who were treated with the laser. The historical control group of 25 patients had an inferior survival with mortality rates of 76 and 100% at 4 and 7 months respectively, compared with survival rates of 60% at 7 months and 36% at 1 year post-intervention in the treated group. 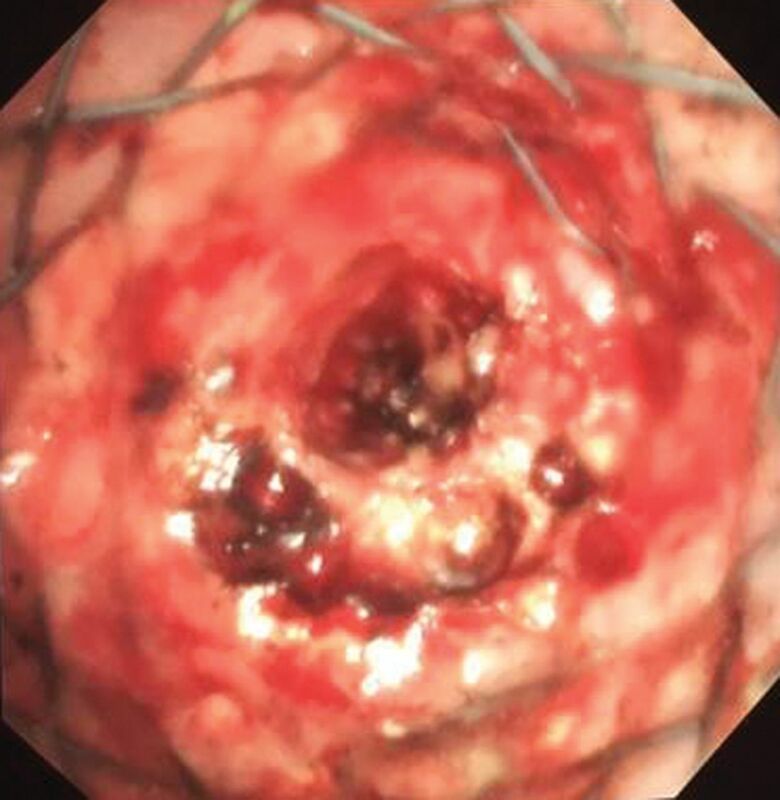 Endoscopic laser resection has been found to be particularly effective in the treatment of endobronchial carcinoid tumours and has been used in preference to more conventional surgical resection in patients with classic carcinoids that are poor surgical candidates [18–20]. However, the obvious advantages of tissue conservation must be balanced against the risks of having underestimated the malignant potential of the tumour. Figure 3 shows a typical carcinoid situated in close proximity to the main carina before and after endoscopic laser resection. a typical carcinoid situated in close proximity to the main carina a) before and b) after endoscopic laser resection. These treatments can be performed with rigid and/or flexible bronchoscopy under general anaesthesia or with flexible bronchoscopy alone under sedation. They involve the application of an alternating electrical current through a probe, snare or needle knife that can achieve coagulation, cutting or vaporisation of tissue. The final effect depends upon the power setting, the surface area, the electrical properties of the tissue and the device-tissue contact time [21, 22]. Usually a power setting of 30-50 W is used with blunt probes and 10-30 W is used with the snare. The cutting mode uses low voltage with high current and achieves the vaporisation of tissue while the coagulation mode uses high voltage with low current and achieves coagulation and cutting with slow tissue heating to 70°C. Coagulation with electrocautery is efficient but is more superficial than with Nd-YAG laser . As with endobronchial laser, the inspiratory oxygen fraction is regulated and is normally maintained at <40% during the procedure . The probe is in light contact with the surface of the lesion while the electric current is applied every 1–2 s. The probe is moved periodically to treat the whole surface of the lesion. For bulky lesions, subsequent mechanical debulking with biopsy forceps may be necessary to restore airway patency. The operator should exercise care when treating areas in close proximity to normal bronchial mucosa as there is a risk of damage to underlying cartilage which may lead to stenosis and malacia [21, 22]. Treatment is reported to be as effective as laser resection with symptom relief being achieved in about 70–97% patients [24, 25]. Complications include haemorrhage, airway fire, perforation, pneumothorax, airway stenosis, tracheo-bronchomalacia, aspiration pneumonia and malfunction of pacemaker/automatic implantable cardioverter/defibrillator [6, 23]. The logistics of providing these treatments may be simpler, when compared with laser resection, as they do not require special protective measures or dedicated support from a medical physicist. An economic study suggests that they may also be cheaper . These treatments have been used to treat radiologically occult carcinomas. Van Boxem et al. offered electrocautery in 13 patients with radiologically occult nonoperable lung cancer and reported 80% response while Vonk Noordegraf et al. reported 97% response in 32 patients with the same pathology. Endobronchial cryotherapy is performed with rigid and/or flexible bronchoscopy with anaesthetic cover and involves repeated cycles of freezing (usually –15°C to –40°C, but sometimes as low as –100°C) during which cells are destroyed by the formation of ice crystals in the cytosol leading to tissue death and necrosis . The usual cooling agents are liquid nitrogen and nitrous oxide. The cryoprobe is connected with the cooling agent storage container (gas cylinder) and console (figure 4). It is inserted through the working channel of the bronchoscope and is held against the endobronchial tumour enabling contact freezing. The efficacy of the intervention depends on the cooling rate, the minimum temperature reached, the number of freeze–thaw cycles and the inherent cryosensitivity of the target tissue (i.e. the water content of the tissue). Cryotherapy is usually administered with palliative intent in patients presenting with airway obstruction due to an endobronchial malignancy [23, 27]. This technique allows relatively large pieces of tumour to be removed (figure 5) and may restore airway patency more rapidly than with the other debulking techniques. Its important advantage over these other techniques, however, is that it does not damage tissue architecture and so facilitates subsequent histological analysis . A further important advantage is that there is no risk of fire with the result that it can be used with relatively high inspiratory oxygen fractions and in close proximity to airway stents and endotracheal tubes. It has a penetration depth in the region of <10 mm and so it is not recommended for lengthy submucosal or extrinsic disease [3, 4]. 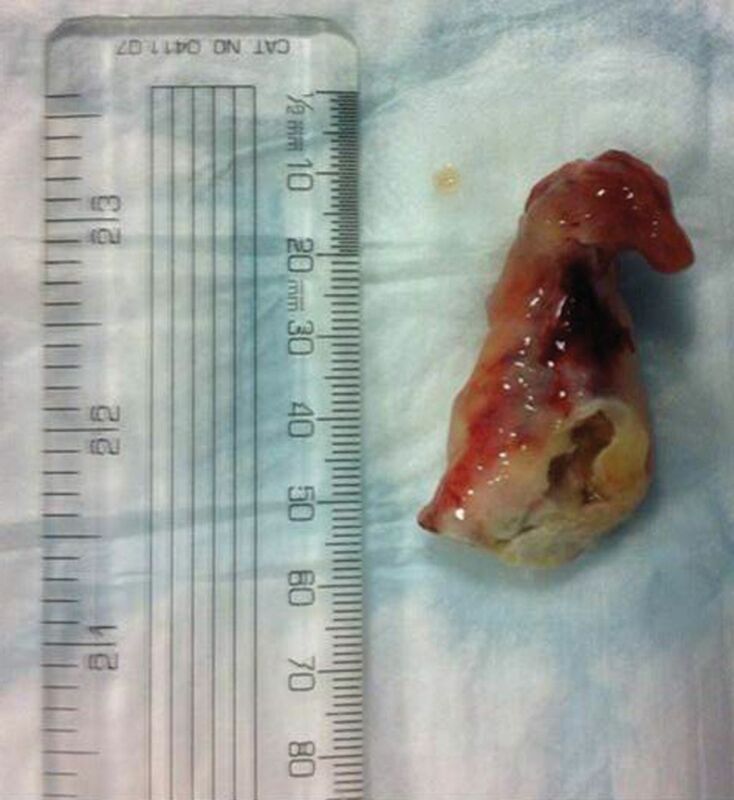 A large piece of tumour removed from the promixal right main bronchus with a cryoprobe. Reproduced from  with permission from the publisher. Its clinical efficacy is similar to that reported for other debulking techniques. Maiwand and Asimakopoulos  reported 521 consecutive inoperable patients with stage IIIB/IV disease presenting with endobronchial obstruction. Haemoptysis, cough and dyspnoea showed improvement in 100, 77.8 and 66.7% (p<0.01) of patients respectively. Forced expiratory volume in 1 s increased from 1.80±0.6 to 1.95±0.8 L (8.3%) and forced vital capacity from 2.50±0.8 to 2.68±0.8 L (7.2%). Quality of life studies showed that the mean Karnofsky score improved from 60±7 to 75±8, median survival was 11.6 months and 2-year survival was 15.9%. Cryotherapy can be repeated if necessary to ensure patency of the airway. Although claims of increased survival obtained with cryotherapy have been made , though confirmatory randomised controlled studies have not been undertaken. The term “endobronchial brachytherapy” is derived from classical Greek and means “a short treatment into the airways” (endobronchial=inside the airways, brachis=short, therapia=treatment). “Short” refers to both the duration of treatment and also to the distance between the radiation source and the tumour. Endobronchial brachytherapy delivers high-dose radiotherapy through the direct placement of a radioactive source into an airway inside an afterloading catheter. In practice, this allows patients to receive additional treatment even when they have already received full doses of conventional external radiotherapy. The catheter is deployed in the airway adjacent to the endobronchial/parabronchial lesion with a flexible bronchoscope. Its proximal end is connected to the radiotherapy source , Iridium-192 being the isotope of choice. Treatment requires a close collaboration between the clinical oncologist and the bronchoscopist and can be offered as a daycase procedure with local anaesthetic and conscious sedation. Endobronchial brachytherapy is one of the oldest endobronchial treatments. In 1922, Yankauer  reported the first treatment of a bronchogenic carcinoma in which he used a rigid bronchoscope to implant radium capsules into an endobronchial tumour and removed them a few days later. Several other applications were reported in the next few years [31, 32]; however, all of them posed a significant radiation exposure to healthcare staff. In 1964, Henschke and colleagues [33, 34] addressed this by developing a remote afterloading device that significantly reduced radiation exposure. Endobronchial brachytherapy can be used either alone or in combination with external radiation therapy/chemotherapy to improve local disease control [23, 35]. However, a recent systematic review reported that the published evidence did not provide conclusive evidence to recommend combined endobronchial and external-beam radiotherapy, endobronchial brachytherapy over external-beam, chemotherapy or Nd-YAG laser treatment . This can also be used in combination with other interventional bronchoscopic procedures such as Nd-YAG laser therapy and photodynamic therapy. It should be considered in patients with early invasive mucosal or submucosal non-small cell lung cancer, infiltrative tumour with endobronchial disease that does not cause life threatening airway obstruction, as a boost treatment to patients that have already received full course external beam radiation therapy with incomplete response/recurrence or as an alternative radical treatment in early stage lung cancer patients at high risk of morbidity and mortality with conventional radical treatment and poor performance status [23, 35]. Table 2 presents the indications for endobronchial brachytherapy. Endobronchial brachytherapy has the advantages that it can deliver a high radiation dose to the tumour and peritumoural tissue and offer precise dose localisation while at the same time the radiation dose to surrounding healthy tissue is negligible [23, 27, 35]. When delivered as part of a combined modality with external beam radiation therapy, it offers better local control , while symptom control is durable and may last up to a period of 6 months . The irradiation does not kill cells directly, but induces apoptosis and decreased cell proliferation by causing single chain breaks of DNA . The effect of brachytherapy is not immediate and is therefore not the first choice for critical airway obstruction, though it has the advantage of providing a sustained airway improvement that is clinically detectable by 4–6 weeks after treatment [39, 40] in terms of symptoms, radiological and bronchoscopic appearances [23, 39, 40]. It has been reported to improve spirometric indices (forced expiratory volume in 1 s, forced vital capacity), pulmonary ventilation and perfusion and exercise tolerance (5 min walking distance) . Potential complications are severe coughing and increased bronchial secretions (especially during the first 4 weeks after procedure), radiation bronchitis, haemoptysis and fistula formation. Endobronchial stenting can be performed with flexible bronchoscopy or a combination of flexible and rigid bronchoscopy depending on the complexity of the case. It generally requires anaesthetic support and fluoroscopy may be necessary to ensure the correct stent placement. Tracheobronchial stenting has been successfully performed in patients presenting airway obstruction due to extrinsic airway compression involving the airways proximal to the lobar orifices. Although, it is generally given with palliative intent to patients with unresectable tumours; it may also be employed as a bridging manoeuvre to ensure a patent airway in patients undergoing chemo-radiotherapy or even curative surgery [3, 42, 43]. In the case of mixed disease (endobronchial tumour and extrinsic compression), stenting can be used in combination with other endobronchial treatments (e.g. laser, cryotherapy) where recanalisation of the airway is ensured first and then airway patency is maintained with stenting. A combination of stenting and other debulking techniques is also used when there is stent obstruction by tumour progression into the airway or granulation tissue (figure 6). An endobronchial stent in place with granulation tissue present at the distal end. The appropriate assessment of the airway and the area to be treated is of paramount importance for the selection of the size and type of stent. There is currently a very large number of silicon and metal stents currently available with relevant deploying systems; Polyflex, Ultraflex and Wallstent (Boston Scientific, Marlborough, MA, USA), Dumon (Novatech, La Ciotat, France), Hood (Hood Laboratories, Pembroke, MA, USA), Dynamic (Boston Scientific) Aero (Merit Endotek, South Jordan, UT, USA). Figures 7 and 8 show some of the available deploying systems. A selection of stents should always be available to suit the individual needs of the patient. Stent deploying system (Aero; Merit Endotek). Another stent deploying system (Polyflex stent, Boston Scientific). The efficacy of airway stenting strictly depends on appropriate patient selection, the anatomical location of the stricture and the underlying pathology. Although reports of successful symptom control in up to 90% of the patients have been made , longer term complications are very common and unavoidable and include infection (up to 15.9%), obstructive granulomas (∼14.6%), and migration (∼4.7%) . Self-expanding metal stents may also fragment and erode through the airway, occasionally with fatal consequences [46, 47]. For these reasons, removable stents (all types of silicon stent and Pyramed and Aero self-expanding metal stents) are the authors’ clear preference in patients with reasonable life expectancies. Photodynamic therapy (PDT) is a minimally invasive endobronchial treatment that has been approved for localised inoperable endobronchial cancer and advanced bronchial carcinoma [48, 49]. There is extensive literature on its use in lung cancer; early-stage, locally recurrent central tumours following definitive surgery or radiation therapy, synchronous lung primaries, neoadjuvant therapy to reduce the extent of surgical resection (pneumonectomy to lobectomy) or to convert originally inoperable patients to surgical candidates and as part of multi-modality treatment for locally advanced disease . More randomised controlled trials are now needed to more precisely define its role in lung cancer management. PDT is a multistep process that is usually performed with flexible bronchoscopy and requires anaesthetic cover. A photosensitising drug that selectively accumulates in malignant tissue is administered intravenously to the patient. The estimated time for this accumulation varies and depends on the type of photosensitiser used, ranging from a few hours to 2 days. After this time has passed, the patient undergoes bronchoscopy with anaesthetic cover. An optical fibre is inserted into the working channel of the bronchoscope and is used to illuminate the tumour with laser light of specific wavelength (620–640 nm) (figure 9). The photosensitiser that has accumulated in the tumour cells is activated and destroys the tumour cells by triggering the generation of singlet oxygen, which results in tumour regression with some selectivity. The depth of penetration depends upon the type of photosensitiser used and wavelength of laser light. PDT works through direct cell killing via apoptosis or necrosis and by damaging tumour vasculature, and it may also induce an inflammatory reaction leading to a host anti-tumour immune response . Treatment of an early lung cancer with PDT. The PDT fibre is placed alongside early cancer. 24 hours after the PDT, the patient is offered a toilet bronchoscopy to clear debris and ensure the patency of the airways (figure 10). The patient needs to be protected from light exposure from the time the photosensitiser is administered until a period of 7 days to 6 weeks in total, depending on the type of photosensitiser used [23, 27, 48, 49]. 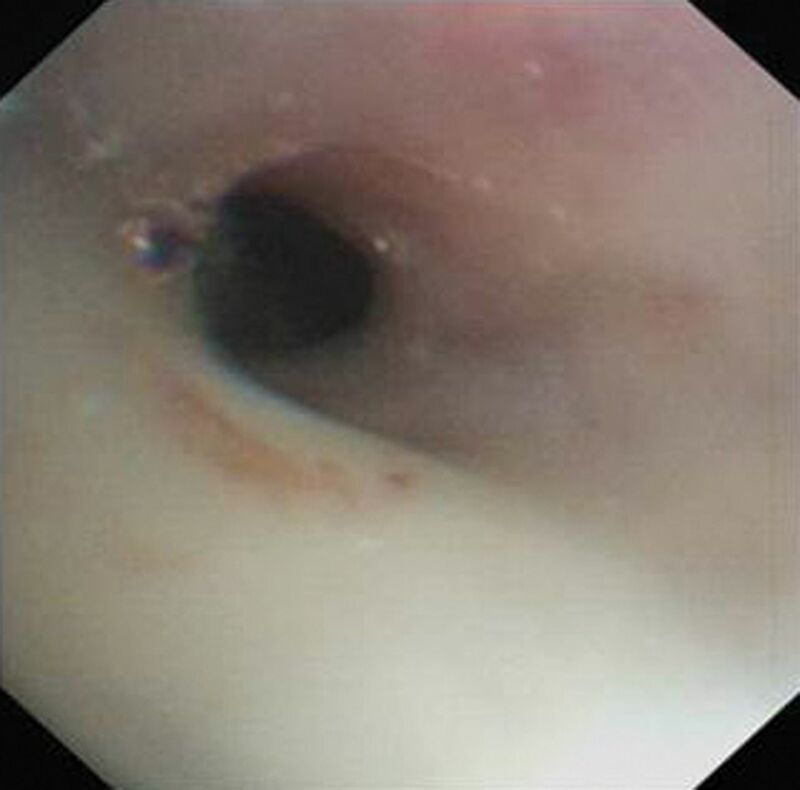 Debris present during post-PDT bronchoscopy. The clinical response to PDT depends on the size of the treated tumour. Furukawa et al. studied 93 patients treated with PDT for 114 central early-stage lung cancers and reported that the likelihood of a complete response was higher for lesions <1.0 cm than ≥1.0 cm (93% versus 58%; p<0.001). Among lesions <1.0 cm with an initial complete response to PDT, 12% recurred. Recurrences with histologic low-to-moderate atypia could successfully be salvaged with additional PDT. The 5-year survival rate did not differ by tumour size (58% versus 59%; p=0.207). PDT may also have a valuable role in patients who develop tumour recurrence following surgical resection of early-stage non-small cell lung cancer. Moghissi et al. reported 31 cases that received PDT on a background of early central lung cancer and were ineligible or declined surgery (n=11), had metachronous (n=1) or recurrent (n=10) endobronchial lesions following surgical resection (n=6) or external beam radiation therapy and/or Nd-YAG laser therapy (n=4). All patients achieved a complete response to PDT although 33% of patients required repeat PDT due to disease recurrence within 15 months of initial therapy. PDT in inoperable non-small cell bronchogenic carcinoma with endobronchial stenosis improves dyspnoea, haemoptysis, and post obstructive pneumonia, reduces tumour stenosis, improves performance status and lung function [53, 54]; however, its effects are not immediate and the formation of debris can further compromise the airway, in the short term. The most common complication is photosensitivity reaction after accidental exposure to intense light  and, for this reason, the authors do not regard it as an ideal palliative treatment for patients with a limited life expectancy if they must avoid daylight for several weeks. Interventional bronchoscopy plays an integral role in the treatment and palliation of lung cancer. In appropriately selected patients, airway stenting and debulking treatments provide immediate relief from airway obstruction and enable subsequent definitive oncological treatments to be given electively and in greater safety. They may also be given with palliative intent for patients who have relapsed at later stages in their management. Some treatments may be given with curative intent in patients with early stage disease who are unwilling or unable to receive more conventional treatments. The selection of cases and treatment decisions should be made on a case-by-case basis after thorough airway assessment, consideration of the underlying disease and its natural history, comorbidities and clinical condition of the patient. European Curriculum Recommendations for Training in Adult Respiratory Medicine. Breathe 2008; 5: 80–120. Central airway obstruction. Am J Respir Crit Care Med 2004; 169: 1278–1297. Endoscopic treatment of malignant airway obstructions in 2,008 patients. Chest 1996; 110: 1536–1542.
. Cryotherapy in endobronchial disorders. In: Beamis JF, Mathur PN, eds. Interventional Pulmonology. New York, McGraw-Hill, 1999; pp. 69–83.
. Quantum Electronics. 3rd Edn. New York, NY, Wiley, 1989; pp. 208–211. British Thoracic Society guideline for advanced diagnostic and therapeutic flexible bronchoscopy in adults. Thorax 2011; 66: iii1–iii21. YAG laser photoresection of lesions obstructing the central airways. Chest 1985; 87: 283–288. Laser treatment for tracheobronchial tumours: local or general anaesthesia? Thorax 1987; 42: 656–660. Endoscopic laser therapy for obstructing tracheobronchial lesions. Ann Otol Rhinol Laryngol 1991; 100: 413–419. Initial combination therapy with YAG laser photoresection and irradiation for inoperable non-small cell carcinoma of the lung: a preliminary report. Chest 1986; 89: 782–785.
. Nd:YAG laser bronchoscopy. A five-year experience with 1,396 applications in 1,000 patients. Chest 1988; 94: 15–21.
. Role of the neodymium YAG laser in the management of tracheal tumours. Thorax 1987; 42: 440–444. Management and prognosis of primary tracheal cancer: a national analysis. Laryngoscope 2014; 124: 145–150. Elective resection of tumours of the trachea and main carina after endoscopic laser therapy. Thorax 1990; 45: 493–495. The National Institute for Health and Clinical Excellence. Lung cancer: The diagnosis and treatment of lung cancer. Available from www.nice.org.uk/guidance/cg121 Date last accessed: August 17, 2015. Changes in regional ventilation and perfusion in the lung after endoscopic laser treatment. Thorax 1990; 45: 248–253. A two-year experience with the neodymium-YAG laser in endobronchial obstruction. Chest 1987; 91: 159–165. Endoscopic treatment of bronchial carcinoids in comparison to surgical resection: a retrospective study. J Bronchology Interv Pulmonol 2012; 19: 29–34. Bronchoscopic therapy in patients with intraluminal typical bronchial carcinoid. Chest 1995; 107: 556–558. Endobronchial treatment of carcinoid tumors of the lung. Thorac Cardiovasc Surg 2015 [In press DOI: 10.1055/s-0035-1549274]. Therapeutic bronchoscopy with immediate effect: laser, electrocautery, argon plasma coagulation and stents. Eur Respir J 2006; 27: 1258–1271.
. Endoscopic applications of electrosurgery: a review of basic principles. 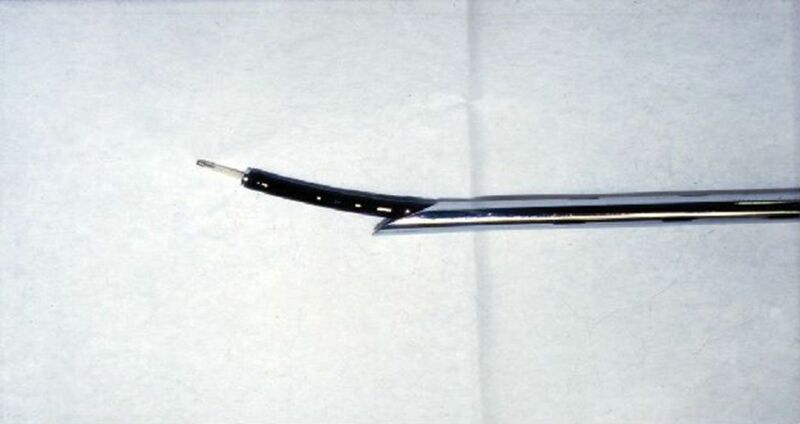 Gastrointest Endoscop 1982; 28: 73–76.
. Tracheobronchial malignancy. In: Reza Nouraei SA, Sandhu GS, eds. Laryngeal and Tracheobronchial Stenosis. Plural Publishing, San Diego (In Press). Nd-YAG laser vs bronchoscopic electrocautery for palliation of symptomatic airway obstruction. Chest 1999; 116: 1108–1112.
. Bronchoscopic treatment of patients with intraluminal microinvasive radiographically occult lung cancer not eligible for surgical resection: a follow-up study. Lung Cancer 2003; 39: 49–53. Radiographically occult lung cancer treated with fibreoptic bronchoscopic electrocautery: a pilot study of a simple and inexpensive technique. Eur Respir J 1998; 11: 169–172. Palliative care in lung cancer: ACCP evidence-based clinical practice guidelines (2nd edition). American College of Chest Physicians. Chest 2007; 132: 3 Suppl, 368S.
. Cryosurgery for lung cancer: clinical results and technical aspects. Technol Cancer Res Treat 2004; 3: 143–150. Cryosurgery for malignant endobronchial tumors: analysis of outcome. Chest 2005; 127: 2007–2014.
. Two cases of lung tumor treated bronchoscopically. N Y Med J 1922; 741.
. Carcinoma of the lung. Arch Surg 1929; 18: 315.
. Carcinoma of the lung and bronchus. Treatment with radon implantation and diathermy. Arch Otolaryngol 1933; 17: 467.
. Interstitial implantation in the treatment of primary bronchogenic carcinoma. Am J Roentgenol 1958; 79: 81–89.
. Remote afterloading with intracavitary applicators. Radiology 1964; 83: 344. Guidelines on the radical management of patients with lung cancer. Thorax 2010; 65: Suppl III, iii1–eiii27.
. Palliative endobronchial brachytherapy for non-small cell lung cancer. Cochrane Database Syst Rev 2012; 12: CD004284. High dose rate brachytherapy as sole modality for early-stage endobronchial carcinoma. Int J Radiat Oncol Biol Phys 2000; 47: 665–672.
. Place of cryotherapy, brachytherapy and photodynamic therapy in therapeutic bronchoscopy of lung cancers. Eur Respir J 2006; 28: 200–218. High-dose-rate endobronchial brachytherapy effectively palliates symptoms due to airway tumors: the 10-years M.D. Anderson Cancer center experience. Int J Radiat Oncol Biol Phys 2000; 48: 697–702. Gutiérrez Jiménez T, et al. Endobronchial brachytherapy in the treatment of malignant lung tumours. Eur Respir J 2004; 24: 348–342. Physiological effect of endobronchial radiotherapy in patients with major airway occlusion by carcinoma. Thorax 1993; 48: 110–114. De Giacomo T, et al. Endoscopic treatment of lung cancer invading the airway before induction chemotherapy and surgical resection. Eur J Cardiothorac Surg 2001; 20: 464–467. Nd:YAG laser resection of lung cancer invading the airway as a bridge to surgery and palliative treatment. Ann Thorac Surg 2002; 74: 995–998. Cardiothoracic Surgery Network. Airway Stenting. Available from www.ctsnet.org/sections/clinicalresources/thoracic/expert_tech-1 Date last accessed: July 20, 2015. Self-expandable metallic airway stents and flexible bronchoscopy: long-term outcomes analysis. Chest 2003; 124: 1993–1999. Airway management of patients with tracheobronchial stents. Br J Anaesth 2006; 96: 132–135. Are metallic stents really safe? A long-term analysis in lung transplant recipients. Eur Respir J 2009; 34: 1417–1422. The National Institute for Health and Clinical Excellence. Photodynamic therapy for localised inoperable endobronchial cancer. Available from www.nice.org.uk/guidance/ipg137 Date last accessed: July 20, 2015. The National Institute for Health and Clinical Excellence. Photodynamic therapy for advanced bronchial carcinoma. www.nice.org.uk/guidance/ipg87 Date last accessed: July 20, 2015. Photodynamic therapy for the treatment of non-small cell lung cancer. J Thorac Dis 2012; 4: 63–75. Locally recurrent central-type early stage lung cancer < 1.0 cm in diameter after complete remission by photodynamic therapy. Chest 2005; 128: 3269–3275. Photodynamic therapy (PDT) in early central lung cancer: a treatment option for patients ineligible for surgical resection. Thorax 2007; 62: 391–395. Acute effects of combined photodynamic therapy and hyperbaric oxygenation in lung cancer--a clinical pilot study. Lasers Surg Med 2001; 28: 399–403.
. Photodynamic therapy for endobronchial malignant disease: a prospective fourteen-year study. J Thorac Cardiovasc Surg 1997; 114: 940.